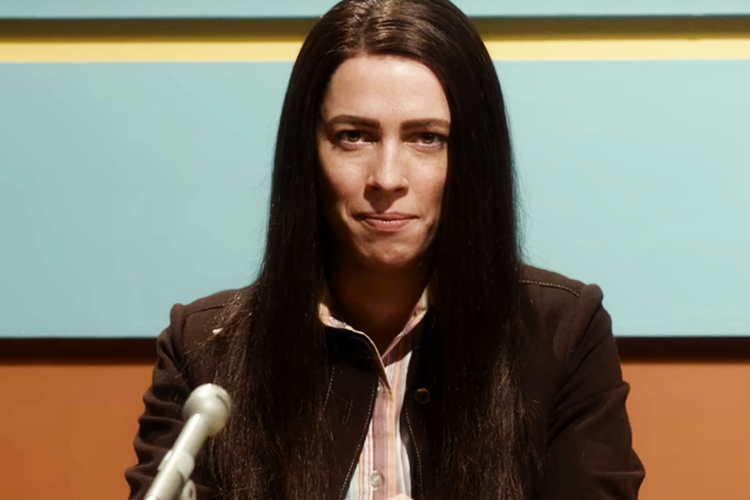 Based on a true story, Christine Chubbuck (Rebecca Hall) is an ambitious journalist for a local Sarasota tv station. Her immense dedication to simple yet meaningful human interest pieces is compromised when upper management intends to increase ratings for sensationalist news. 'If it bleeds, it leads' becomes the new standard, and Chubbuck struggles to match the style going as far as killing herself on-air. Despite knowing the outcome of Chubbuck's life for this biopic, Christine intensely and thoughtfully delves into her mindset and struggles, especially mental health. Just shy of her 30th birthday, Chubbuck is a person unto herself. She's never been involved with someone romantically, closes off from potential friendships, and has a complicated relationship with her mother. Getting married and having children is on her future itinerary, but it's sideswiped by plaguing health issues both physical and emotional. A lingering depression pushes her perseverance in the best and worst ways from an iron-fist like grip on her standards to an inability to communicate her needs to others. Despite her wanting more personal relationships, she's left with only a job, one of the utmost integrity in her eyes, to occupy her time which becomes the last thing she has to hold onto. Rebecca Hall gives a tremendous performance portraying Chubbuck's downward spiral. Much of her character's personality and behavior is internalized. She has a tough time expressing herself to others, and when she does it's self-deprecating, retaliatory, or as harsh bursts of judgment towards herself. Both professionally and personally, Chubbuck continually asks questions, but tries to possess all the answers; a misfit who tries so hard to act as normally as everyone else does. Self-inflicted and environmental pressure weigh on her ability to handle and control what goes on in the studio, at home, and during telecasts. Hall's portrait is passionate and subtle capturing multiple sides of how her character feels: kindness, sympathy, detail-obsessed, hard-working, burdensome, self-conscious. She doesn't limit herself to one trait or another but undergoes many different emotional hurdles at once. Like mental health itself, Chubbuck's struggles are a conglomerate of issues. In contrast to Chubbuck, other characters like Maria Dizzia (Jean Reed), weatherman Steve Turner (Timothy Simons), and on-air anchor George Peter Ryan (Michael C. Hall) have faced obstacles, but found ways to cope or "not dwell on everything". There's a nice mix of people surrounding Chubbuck who try to be her friend or let her be her own person. Before the inevitable ending, the movie hints at possibilities if she didn't judge herself too harshly or unloaded her burdens onto someone without feeling burdensome, if she got fuller treatment for her depression. There's no way of knowing what could've happened if her life played out differently, but the brief inclusion shows the script's thoughtfulness to its leading character. Christine as film is a fascinating feat as a biopic considering Chubbuck's life isn't well-documented. Screenwriter Craig Shilowich interviewed previous colleagues and researched news pieces to create what he could of Chubbuck. He also connected to her depression making the project a personal examination of his own experiences, and one that movie goers who suffer from depression may relate to it deeply. Considering how many biopics over-indulge in someone's life to justify the commercial appeal, the movie is an impressive and intimate character study. Director Antonio Campos adequately recreates the 1970s from the news stations equipment, occasional overgrown sideburns, and flared pants. The era serves mostly as a backdrop to its leading lady. At most, when Chubbuck concocts an idea to try to fit in with the new rules, the soundtrack kicks in with a catchy news-track similar to what a viewer would hear turning into News Update from Saturday Night Live or 60 minutes. Her life was her job, and it fittingly plays into Chubbuck's 'grasping at straws' brainstorming and avoids being a cheap attempt to be more stylistic. A common criticism is the film's "exploitative nature", which wasn't the case at all to me. Softly in the background, the story focuses on sensationalism turning into "hard hitting news", mostly on Chubbuck's attempts to be promoted and her work validated. On the cusp of Watergate, and history forever holding it up as a daring example of journalism, the era's sexist nature ultimately cups her ambition - no matter the desperate lengths she goes to. Adding to the depth of her death, Chubbuck is more of a prophet having seen the graphic nature news would venture, and she wanted to hold onto her integrity. Regardless of her fate, culture carved its own path, fueled by click-bait titles and attracting readers into violent-gossipy articles to make gruesome acts appear glamorous. The movie doesn't make her a poster-girl for how our world would turn out, leaving the parallels of the media and her final moments a poignant tragedy. Many celebrities or public figures, maybe even people we know or are well-acquainted with, who suffer a downward spiral aren't looking for fifteen minutes of fame as the news often reports; they're crying out to be seen and heard. This point is well-established throughout, and it's difficult to not feel relatable to her in many ways. Slow-burning and tactful, Christine is a fascinating examination of a woman in a man's world, her mental illness, and going to extremes as a devastating last resort. Have you seen Christine What are your thoughts?